Longwood Gardens, a Kennett Square mainstay, is the obvious choice of many for a leisurely indoor activity. Likewise, the Orchid Extravaganza is a warm oasis for locals come winter. But even perennial visitors might not know the scoop behind their favorite floral haven. Here, a roundup of all the need-to-know insider info about Longwood Gardens‘ famous orchid display. Think of it as a crash course before your next visit. 1. The proof is in the numbers. Longwood Gardens’ Orchid Extravaganza has over 5,000 orchids in the exhibit and horticulture experts began collecting in 1922. 3. Who knew that vanilla comes from the orchid family? Now, don’t go flavoring your chocolate chip cookies with orchids. Instead, on Saturday March 14 from 11am to 2pm, bring the kids to the season’s last OrKID Day where little ones will be invited to investigate vanilla at the Very Vanilla Discovery Station, as well as enjoy several other kid-friendly activities. 4. Longtime visitors, you’re in for a treat. This year, the Orchid Extravaganza will feature 12 Phalaenopsis Sogo Yukidian ‘V3′ orchids. (Yep, they’re as awesome as they sound.) The super-rare orchids are grown in Taiwan and are recognized for the number of flowers on each stalk. Plus, word is that this is one of the first times the orchids have been displayed in a public garden in the United States. Head to the Center Walk to see ’em. 5. It takes a village: about 65 staff members and volunteers work to create the orchid display. The team includes a lead Display Designer, a lineup of gardeners, as well as carpenters, plumbers, and metal shop wizards that aid in creating the frames and forms for the whimsical displays. 6. If the warm, four-acre conservatory wasn’t enough to have you start dreaming of spring, than the oncidium waterfall display located in the Cascade Garden will do the trick. Fifty of the blooms are creatively arranged to resemble a waterfall of glorious, colorful flora. 7. As one Orchid Extravaganza wraps up, next year’s event is already in the planning stages. The storied display takes a year to create its masterful execution. 8. Here’s the behind-the-scenes scoop; the super-impressive orchid collection doesn’t maintain itself. Instead, five greenhouses with regulated temperatures, lighting, and humidity keep the flowers in tiptop shape. 9. Fans of the Meadow Garden will love the scaled-down Orchid Meadows. 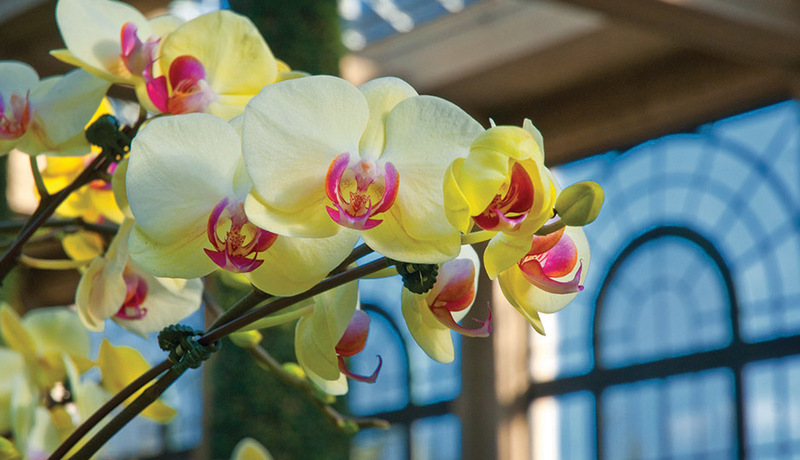 Located at the Patio of Oranges, the meadows house over 350 hand-selected, expert-approved orchids. 10. You’re not the only fan. Over 75,000 people visit the Orchid Extravaganza from its opening in January until its close at the end of March. This year, it closes up shop on March 29, so mark your calendars! Admission is $20 for adults, $17 for seniors (age 62+), $10 for students (ages 5 to 18 or with valid student ID) and free ages 4 and under. For more information about the Orchid Extravaganza at Longwood Gardens, click here.